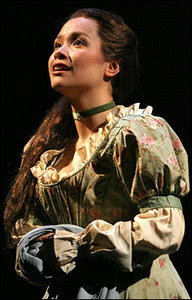 There was a standing ovation after Lea sang the "I Dreamed A Dream". Now, if you're in a concert and you see a standing ovation on the second song, you know it's a great concert. I was thinking, this concert is already worth every penny I spent on this even though it's just the second song. Next, she sang a Tagalog song titled "Bakit Labis Kitang Mahal". Gosh, I remember watching this movie, her movie with Aga Mulach where she sang this song. It made me a bit nostalgic. I know this song was popularized by Anthony Castello back in our days, but Lea sang it beautifully> she even encouraged all of us to sing along with her. Next song was "You Must Love Me". I am not so familiar with this song, which I learned that night that it was from Evita. Now for one of the most dramatic moment for me - after the song from Evita, Lea sang a song from Miss Saigon. She sang "I'd Give My Life For You". Now you've got to know that I must have sung this hundred times already. I love this song, and it was incredible to hear Lea sing it live. Now that she herself is a mom, she sings this with so much passion. There were tears in my eyes. There was a standing ovation after she sang this song. This song ended the first Act of the Concert. There's a Youtube video but the embed feature was disabled, so if you're interested to listen to Lea sing this song, go to YouTube here. Great to know you were able to watch her concert there in Maui! She had concerts in Bacolod and Iloilo early this year, but unfortunately, I had to fly back to Switzerland on the 28th of January! Sayang. But I was able to watch some of her plays, performances in Disney movie previews, and her "A Miss Called Lea" at the PICC in 1990.